While work was far from over, the worst months of 16-hour days, cutting down and chipping more than 25,000 trees in one year, had appeared to be behind them. So it hit McFarland hard when he saw pictures of what he knew was damage from beetles gnawing tunnels through a handful of red maples in Boston, just 44 miles east. And the news got worse — almost surreally so — as the hospital parking lot where the infested trees were located was directly across the street from Harvard’s Arnold Arboretum, home to a priceless, world-class tree collection. Back in Worcester in 2008, as USDA’s McFarland put it, a multi-agency partnership to eradicate ALB in Massachusetts thought it had drawn a line in the sand. The idea of a similar situation, now in Boston, was difficult for the head of the Massachusetts eradication effort to stomach. The four-year operation that followed would, however, provide a unique microcosm of the many interlocking pieces needed to stop an invasive pest. To fully understand why the discovery in Boston was so frightening, consider that, to date, ALB has been responsible for the removal of 133,000 trees in the United States since its discovery in 1996 in Brooklyn. Infestations have since popped up in New York, Illinois, New Jersey, Massachusetts and Ohio, with eradication efforts costing $550 million so far. The beetle is slow, but it is hungry, with 13 known genera of host trees. Maple is a favorite, making ALB a major economic threat to syrup and timber industries, plus tourism drawn to New England’s signature fall foliage. If unchecked, one estimate of potential cost in urban trees alone is nearly $700 billion, nationwide. An ALB infestation tends to be a slow, quiet burn, with multiple generations often feeding on the same tree or those very nearby. The pest’s life cycle starts with eggs laid along the trunk or sturdy branches, where chubby, cream-colored larvae that can grow as long as 2 inches hatch. Larvae bore tunnels through the trees during the winter, feeding their way to pupal stage and then, in the summer, chew their way out of perfectly round holes about the size of dimes. The whole process normally takes a year, and while the black, white-spotted beetle can fly, it’s a lazy bug, so the spread is slow. But as with all invasive pests, the real problem is us. Just as they first hitchhiked here from overseas in wood packing material, the beetles can hitchhike for miles in firewood in the back of a pickup headed to a camping spot in New Hampshire or Vermont, for example. If beetles take hold in a new location, it’s like a spark, starting a whole new, quiet burn. “I couldn’t sleep that night, from trying to think about how gross was this, how large was this infestation?” says McFarland, who heads the Massachusetts eradication effort led by the USDA’s Animal and Plant Health Inspection Service (APHIS) and the state’s Department of Conservation and Recreation (DCR). ALB has been his world for about 13 years now, starting with the original infestation in New York, but he became something of a general in the battle when he took over the Worcester operation in 2008. He teamed up with DCR’s Ken Gooch to run a multiagency operation that would grow to employ about 100 people. McFarland, who has a gruff, no-nonsense way of talking that’s balanced by a friendly laugh, left for Boston early Saturday morning to spend the day searching the area for signs of the pest and firing off texts to anyone else he could mobilize. Faulkner Hospital’s grounds supervisor, Deb LaScaleia, arrived at the hospital grounds Sunday morning to find federal employees swinging from her trees and a small team’s makeshift operation setting up in her parking lot. Days earlier, she had spotted piles of sawdust-like material at the base of some of her trees while walking the grounds. “Upon closer inspection, you realize the volume and the quantity of what had been going on.” She saw the exit holes, and wasn’t sure exactly what it was, but had taken plenty of classes and seen the latest on invasive pests at trade shows. She called the hospital’s arborist, who called APHIS in D.C., which kicked off the whirlwind in what she thinks of as her own yard. The site of the reported infestation was a row of six red maples in the landscaped parking lot area in front of Faulkner Hospital, a 17-acre property facing the Arboretum to the southeast. To its west lie the Allandale Woods, Boston’s second-largest unfragmented woodlands, full of sugar maple — all of which is surrounded by some of the city’s greenest neighborhoods like Roslindale and Jamaica Plain. One alarming turn of events that day was that, while there were no fresh holes when McFarland left on Saturday, there now were two. Overnight, two adult beetles had emerged. After hours of searching, a group of six people found both of the adult beetles crawling on the trees. What followed, as LaScaleia describes, was like something out of CSI. The team downed the six maples and began peeling them apart with chisels and hand axes. 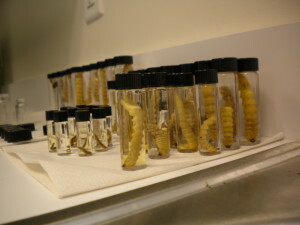 They found 33 larvae and 13 adults, some of which were getting ready to emerge, but were now destined for the lab. “Because there were only six trees, we could do all the forensics. It was pretty wild,” says Gooch, who is now DCR Forest Health Program supervisor and had also been working with ALB on some level since the first New York infestation. Investigators started doing several “trackbacks,” including checking whether the beetles could have come in the nursery stock (nope), tracking the serial numbers of medical equipment deliveries the hospital had received from Europe (nope). They did genetic testing on the beetles and were able to eventually confirm that they were connected to the infestation in Worcester. While they weren’t seeing other signs of infestation, no discovery in North America had ever been just a handful of trees. Even the smallest infestation, in Illinois, had ended up downing around 1,800 trees. To use a phrase that would come up more than once, people were freaking out. That Monday, Stephen Schneider hadn’t turned on his Blackberry yet. It was a national holiday and the manager of horticulture at Harvard’s Arnold Arboretum was at home unwinding. When he finally did turn on his phone, it was exploding. Arnold Arboretum is 281 acres of research grounds established in 1872 and designed by Frederick Law Olmsted. It’s a meticulously curated collection of 15,000 living specimens from around the world, and its maple collection alone ranked as the most significant in the world in a 2010 survey by Botanic Gardens Conservation International. It is adored by the city and beyond. Fortunately, shortly before the Faulkner discovery, the Arboretum staff had finished two scoutings for ALB, albeit looking at random samplings and the perimeter, so Schneider felt reasonably confident. His biggest concern was a naturalized area right near the hospital called Central Woods that the Arboretum doesn’t curate, but is full of beetle food. When there’s an ALB infestation, the feds take control and move fast, and everyone at Arnold — where they usually have 100 percent control — knew that. Schneider and his team’s strategy was to be as accommodating as possible. For example, he first met the APHIS and DCR team before a press conference with “gifts in hand,” reams of records about the site. This approach wasn’t entirely altruistic. Schneider not only hoped to work in suggestions when it came to things such as the process for any potential tree removal, he also wanted to get the investigators in and out as quickly as possible, limiting any disruption to a sensitive collection. And while they feared the feds would have a “we’ve got this, thanks” attitude, Schneider said the tone was far more inclusive. What followed was a survey of every potential host tree in the 10 square miles surrounding the six maples — slightly more than 90,000 trees in the arboretum and the surrounding area. The area was also put under quarantine, meaning no host wood could leave, and anyone working with host wood in the area needed special training. Outreach was crucial. APHIS freed up a separate $30,000 budget to immediately run advertising in the area. The team worked with the city parks, green organizations, nonprofit “Friends of” groups, neighborhood associations and anyone else they could to distribute information. By the end of 2010, surveys still hadn’t found more infested trees, and people were feeling like they had dodged a bullet. But APHIS protocol calls for treatment with imidacloprid, a common pesticide that is effective against ALB as a prophylactic. The plan was to make trunk injections in a quarter-mile radius of the six maples, once a year, for three years. When McFarland and Gooch first brought this up, Schneider wasn’t happy, and wanted to find an alternative. The Arboretum uses pesticides, but on a very strict basis. Not only that, they’re surrounded by a highly environmentally conscious demographic that includes many young families, and imidacloprid — which has shown up in discussions of possible contributing factors of colony collapse disorder among honeybees — has been gaining a bad reputation. The Arboretum was in a tight spot, made more complicated by the fact that Harvard actually uses the land on a 1,000-year lease from the city of Boston. As landlord, it appeared the city could authorize treatment. “Spirited debates” followed. Eventually, compromise — and technology — saved the day. Schneider and a research fellow used a newly acquired mapping program to take a scalpel to the USDA’s treatment zone. One way to think of it — when it comes to the size of the treatment area, USDA rounds up to be on the safe side, the Arboretum had tight enough records it could round back down, ultimately reducing the number of trees that received pesticide treatment — mostly by soil injection, to limit damage to trees — by half. With Schneider and the Arboretum satisfied, APHIS still had to engage with a concerned public. This is when, you might say, the love fest ended. A petition was started to stop the Arboretum’s soil treatments. APHIS fielded many calls and held a series of public meetings. “A lot of those public meetings were quite contentious,” McFarland recalls, but ultimately, most residents accepted the treatment, with 95 percent of host trees in the radius receiving the pesticide. Outside of the arboretum, most trees received trunk injections instead of the soil injections that were the source of much of the public’s objection. In summer 2014, with the 10-square-mile area surveyed once, and the core of the infestation surveyed multiple times, the program held a press conference to announce eradication. They now believe a vehicle that parked at the hospital was carrying materials that contained ALB, which crawled out and found a nice little row of maples and never made it any farther. Back in Worcester County, now October 2014, I’m tagging along with a survey crew in an outlying neighborhood, the kind of beautiful, gold- and scarlet-lined street that makes fall in New England incredible. A team of six tree-climbers scrambles up a stand of maples behind a private backyard. With every tree cleared, they mark their initials with chalk and update their records on a handheld device. About 5 million trees have been surveyed and 34,000 trees have been removed in the Worcester area to date. For comparison, Central Park in New York has about 25,000 trees. In 2008 and 2009, nearly 17,000 infested trees were found in Worcester. As I walked through the city with the survey crew in October, that number was down to fewer than 300 for all of 2014. The city is replanting with much higher diversity. “In 10 years, it’s going to be the ideal urban forest,” Gooch says. But the larger question remains whether nationwide eradication is possible. Regulations on global shipping materials have been clamped down since 2002. But Ohio is fighting infestation. Long Island, once thought clean of the beetle, has a new infestation. Experts I talked to believe ALB is one invasive pest that has a good possibility of eradication. The wild card where opinions differ is how much ALB is currently out there. Worcester’s infestation went undetected for 12 years. He still thinks the agencies need to start branching out more, hunting ALB down. And a new, joint program with the U.S. Forest Service, APHIS and DCR will begin sending out teams of surveyors to investigate high-risk areas in Massachusetts. But the USDA will never have the funding to go everywhere the beetle might be, and that’s where the public is important. Gooch and McFarland both believe part of the reason the Worcester infestation got so out of hand is because, after earlier infestations were contained, people let their guards down and agencies could have done better at outreach. These days, the USDA has an annual outreach budget of around $1 million, including ads of all sorts, partnerships and social media. The agency received 184 online reports of the beetle — mostly false alarms — in just one recent month, 72 from Massachusetts. At the height of the Boston operation, Deb LaScaleia would come to work and find specimen jars of all kinds of insects, mostly stinkbugs, left for her by concerned hospital staff. That kind of diligence is how Clint McFarland, the optimist, thinks they’ll win. The telltale holes peppering maple trees might show up in a new, far-off location. But eradication can still be won if that next dreaded email on McFarland’s phone is reporting another Boston and not another Worcester.